Are All Your Contacts Accounted For? Do you have any contacts who have never been added to a list? You might! As a best practice, we recommend adding all contacts to at least one list once they’re in your account. If you think of the customer journey as a train picking your contacts up as it rolls through the station, getting new contacts on a master list helps ensure they don’t miss their ride. If they exist on a list, it’s easier to make sure they have the experience you planned for them as they journey through your marketing funnel—from contact to lead, lead to customer, and customer to advocate. Simply go to Contacts, click the drop-down menu next to LIST, and select “None” to find all contacts who currently do not exist on a list. 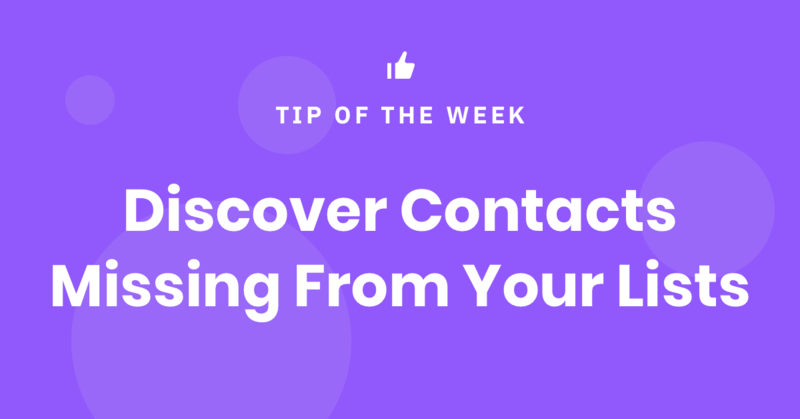 Check out our Help article to read more about organizing your contacts, including suggestions for grouping your contacts with lists, tags, and a combination of both.